The direct entry into the ski circus is located only 150m away from our locker. By Mitteregglift no. 37 takes you to Westgipfelbahn & Zwölferkogelbahn. With a short walk through the center of Hinterglemm one is soon at Reiterkogel lift. Our 1st House Departure: The ski slope 39a on the Reiterkogel in Hinterglemm ends right at the neighboring hotel. With snow, it is sometimes possible to drive almost to the locker. Our 2nd House Departure: About the ski slope 6a on the western summit in Hinterglemm will take you directly back to Mitteregg ski lift. 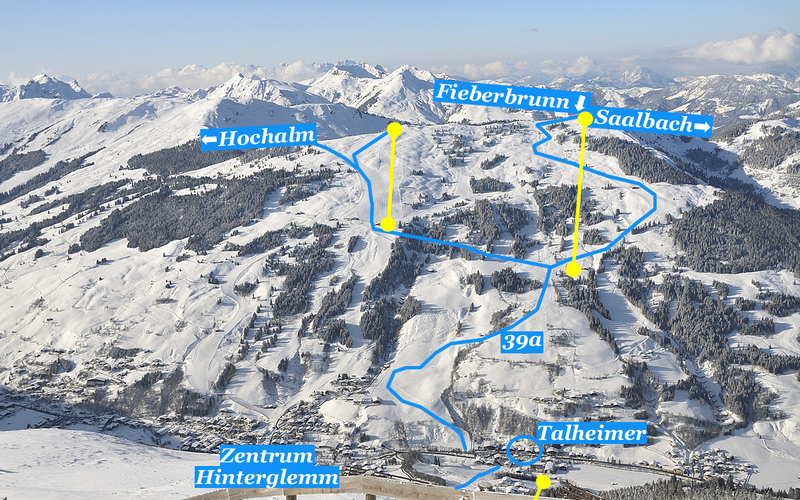 The Talheimer is from both sides of the valley in Saalbach Hinterglemm with skis possible. With the slope 39a of the southern slopes and the ski slope 6a of the northern slopes. The ski bus stops directly at Talheimer. This is practical, direct access & simple to Schönleitenbahn for Schattberg Xpress, the Zwölferkogel and Hochalmbahn - there you can alternatively start with the skiing. 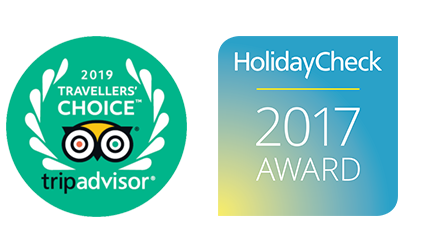 2x in the morning (9 am to 9.30 pm), a VIP shuttle tractor to Reiterkogelbahn, Zwölferkogelbahn & ski school Hinterglemm West (the VIP shuttle, we have a partner hotel, can sometimes be full and therefore no longer Carpool offer). 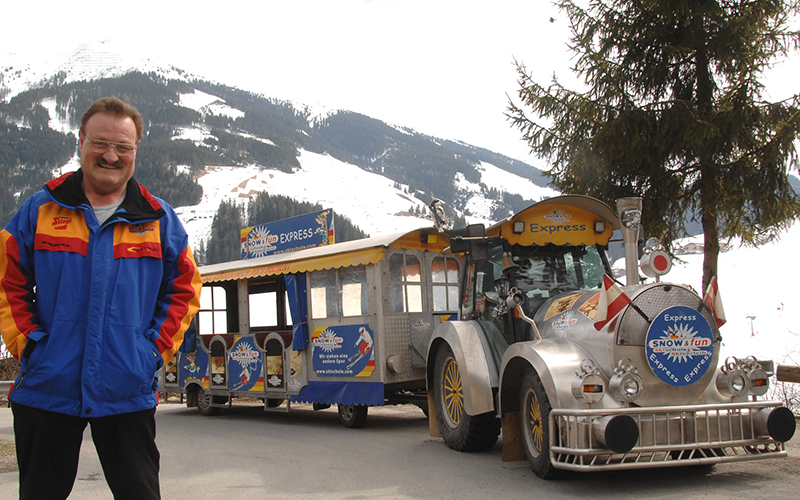 On demand, we have the morning at 8:20 AM to at Kaiserwetter an Early Bird VIP shuttle Schattberg Xpress in Saalbach. The beginners & training ground Wiesenegg is located 150m and provides a lift for beginners (no. 40) with a flat nursery slopes. SkiLL Ski School is located directly opposite and offers courses for skiers and snowboarders. Courses you can book in advance or on-site online. 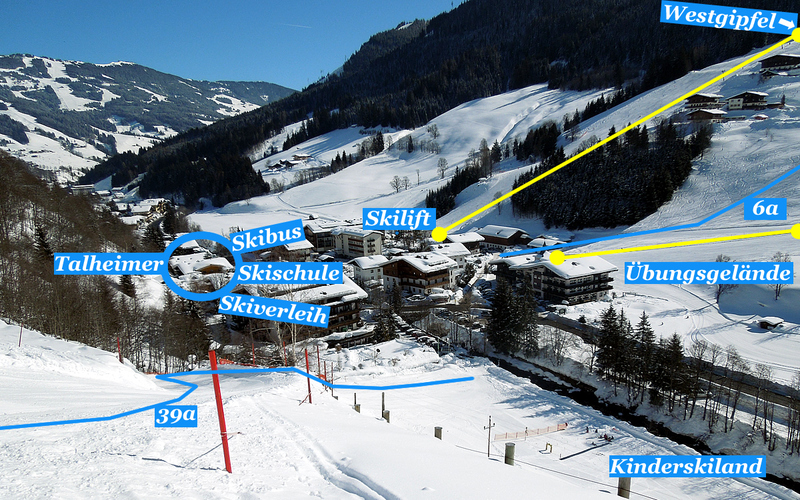 The Kinderskiland with magic carpet for ski lessons for children from 3 years is 100m away. The Hinterglemmer center is 600m. You can stroll the winter hiking trail on the Saalach and soon reach the center. The Glemmtaler winter hiking trail leads right past the house and allows you a leisurely stroll to Saalbach Hinterglemm or. 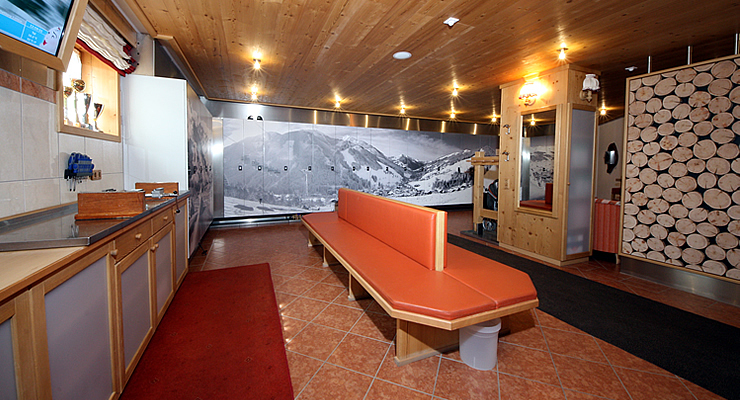 The Talheimer has a spacious locker: A private ski room per room, boot heater in the ski wardrobe, 2 ovens for jackets, gloves, hats and socks, Helmet cabinet, waxing bench for Ski & Snowboard grow, current magazines, leaflets and an internet station. Once a week organize Talheimer's a house ski day for very good and good skiers from 8:30 until about 14 o'clock. Piste skiing & freeriding is possible on request, also for very good skiers. 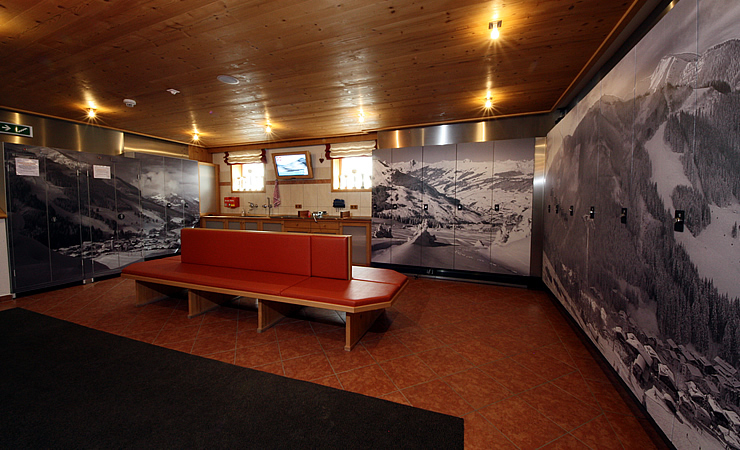 Equipment You can with our partner »Ski Hubsi's Sport Shop in Saalbach Hinterglemm borrow. The Skicircus has opened this winter from late November to mid-April. 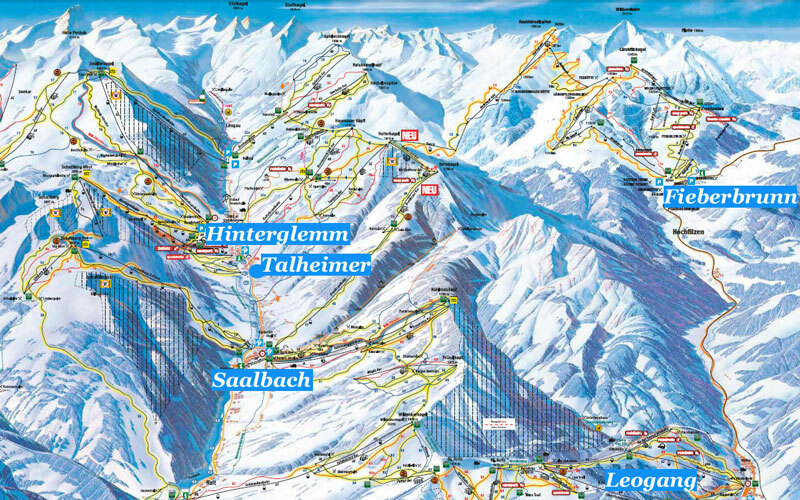 In our region there is the Schmittenhöhe (20min) and the glacier in Kaprun (30min). The glacier offers a 100% guarantee of snow, whatever time of year!